Why it matters: Amazon's massive lead in the e-reader market has not deterred Barnes & Noble from competing. The company released an updated 7-inch Nook tablet with a bargain $49 price tag that could sway the budget-conscious consumer. Despite the runaway success of Amazon's Kindle line, Barnes & Noble continues to try to challenge Amazon's hold on the e-reader market. The company is updating its 7-inch Nook with a very attractive $49 price tag. On the hardware front, the new 7-inch Nook tablet has modest specs: 7-inch 1024x600 LCD display, front (VGA) and rear (2 MP) cameras, headphone jack (we all know how much of a premium that is these days), 16GB of storage that's expandable to 128GB via microSD, Wi-Fi and Bluetooth. Barnes & Noble also promise up to seven hours of battery life. Unfortunately, it charges using the older microUSB and not the newer USB-C standard. Because Nooks are basically Android tablets, one advantage Nook tablets have over Kindles is having native access to the Google Play Store. While there are ways of getting the Play Store on Kindle Fire tablets, it's nice to not have to use a workaround for people who aren't computer-savvy. 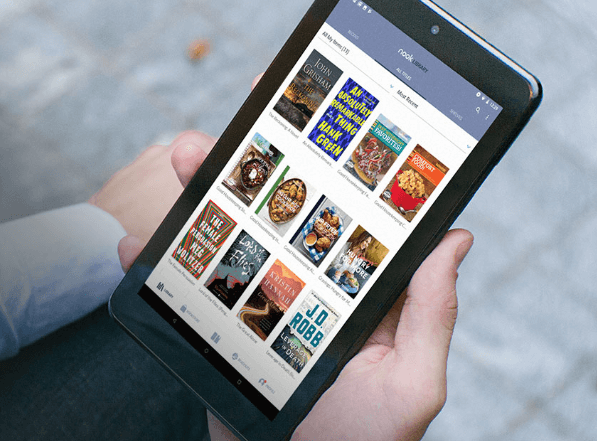 This seems to be purely a financial play for those customers who may just want a low-cost tablet to read books on and install a few Android apps. Ironically, you could just install the Kindle app on the Nook. At $49, it undercuts Amazon's cheapest Kindle by about $30 and lands itself squarely in impulse buy territory for the budget-conscious. For those interested, the new Nook tablet is available either in Barnes & Noble bookstores or online.